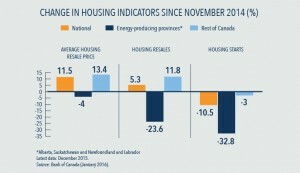 Canada’s housing market continued to prove its resilience in 2015, as the combination of rock bottom interest rates and a competitive finance system outweighed the negative shock of plunging oil prices on the economy. Actual home sales rose 10% on a year-over-year basis in December, with first-time homebuyers representing a growing share of the residential mortgage market. Out of 14.1 million households in Canada, 9.74 million were home owners at the end of 2015 and nearly 60% have mortgages. While housing market indicators for Canada as a whole remain strong, heightened economic uncertainty and an uneven job market could make it difficult for home sales to maintain their solid growth pace. Increasing affordability challenges, especially in major cities like Toronto and Vancouver, could pose an additional barrier for financially sound borrowers who may not qualify for a large mortgage. A weak Canadian dollar also means that foreign demand in these and other housing hot spots will remain elevated, as investors look to diversify their savings in Canadian real estate. Home prices in Toronto and Vancouver in particular are expected to remain high for the foreseeable future. Residential mortgage lending in Canada rose in 2015, as buyers rushed to take advantage of falling interest rates. The Bank of Canada (BOC) slashed interest rates twice in the first-half of last year to contend with the negative consequences of collapsing oil prices and weakening inflation. As a result, the average mortgage rate for homes purchased in 2015 was 2.8%. Nearly 1 million mortgage holders renewed their commitments during 2015, saving an average of 0.75 percentage points. In 2015 approximately two-thirds of residential mortgages were fixed rate, compared with a quarter that were variable (see Box 1). For 2015 purchases, 76% were fixed rate compared with just 20% that were variable. 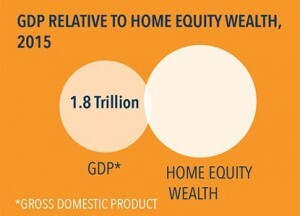 The total value of home equity wealth in Canada was approximately $3 trillion in 2015. By comparison, the nation’s gross domestic product (GDP) – the value of all goods and services produced in the economy – was abound $1.8 trillion. While this speaks volumes about the strength of Canada’s housing market, it also raises concerns about the devastation that would ensue should property values depreciate. While this isn’t expected to occur, policymakers suggest that a growing share of homeowners, particularly in Ontario and British Columbia, are “overburdened” by high mortgage debt. Less complex and rigid than traditional bank loans. No mandatory insurance rates on deposits less than 20% of a home’s value. Viable option for borrowers who are unable to obtain a mortgage through their bank due to a strenuous financial situation. Ideal for investors looking to buy and sell residential property for profit. In exchange for a simpler application process, quick turnaround and more flexibility, private loans carry higher interest rates than conventional mortgages due to the increased risks assumed by the private lender issuing the loan. In general, the interest rate on a private mortgage loan ranges from 5% to 18%. The rate depends on a number of factors, such location, risk, loan-to-value (LTV) ratio and whether the loan is for a first or second mortgage. By comparison, the average mortgage interest rate issued by a bank or credit union in 2015 was less than 3%. Most LTVs on private first mortgages are up to 75%, although this can vary slightly in rural versus major urban centres. Conventional mortgage loans may carry an LTV up to 95%, but this only applies to home purchases insured through the Canadian Mortgage and Housing Corporation (CMHC). Otherwise the maximum LTV for a refinance loan is up to 80%. Since private mortgage loans are issued by private investors as opposed to institutional banks or credit unions, data on the volume and number of transactions are difficult to obtain. However, we do know the market is growing. 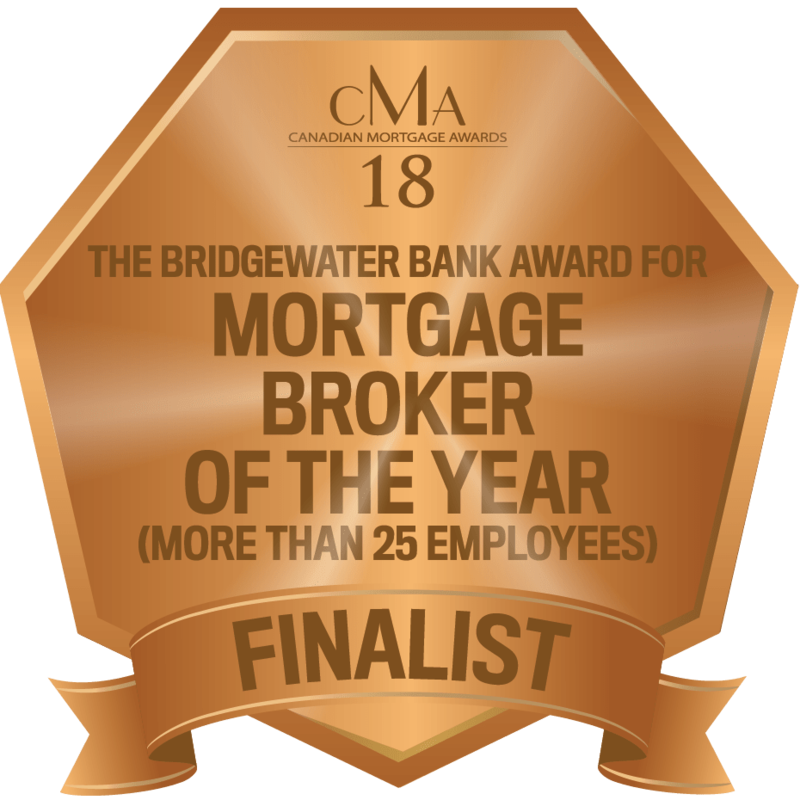 According to data compiled by CIBC World Markets, the value of mortgage loans issued by alternative lenders grew by 25% in 2014, compared with an average growth rate of 4% for the overall mortgage market in the same year. Although alternative lending remains small compared with the overall market, its share has exploded (see figure 2). Canada’s mortgage market is expected to grow steadily over the next two years, as low interest rates and a relatively stable financial system continue to fuel demand for residential housing. After averaging 7.7% annual growth over the past decade, mortgage credit growth has slowed to just below 6% year-over-year. This figure could fall to about 5.25% by the end of the year before holding steady at 5% during 2017. If these estimates hold, mortgage credit could grow by about 11% by the end of 2017. First-time home buyers make up a growing share of Canada’s mortgage market, having accounted for around 45% of all homes purchased between January 2013 and May 2015. Although first-time buyers relied more on loans and gifts from family to make their down payment, three-quarters of applicants were pre-approved for their mortgage. The average purchase price for first-time buyers ranged from $251,000 to $333,000, with two-thirds making a down payment of 20% or less. The prolonged downturn in oil prices means that strong residential housing activity is not shared across the country. Oil producing regions such as Alberta, Saskatchewan and Newfoundland and Labrador have witnessed large declines in housing activity (see table 1), including a spike in foreclosures and delinquency rates. For these provinces, housing starts slowed in January to their lowest level in four years, a trend expected to continue as the oil price collapse enters its second year. To-date, declining sales in oil-producing regions have been more than offset by strong sales activity and price growth across much of Ontario and British Columbia. All said, annual home sales in 2015 reached their second-highest level on record and were only 3% shy of the all-time high set in 2007. For the most part, analysts are forecasting a soft landing for Canada’s housing market. 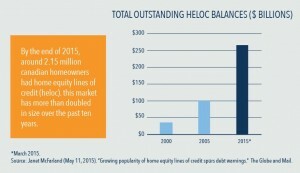 By the end of 2015, around 2.15 million Canadian homeowners had Home Equity Lines of Credit (HELOC). This market has more than doubled in size over the past ten years (see figure 4). Naturally, banks favour the HELOC because it allows them to make fully secured loans against a client’s home. Consumers may also favour a HELOC because of the large amount of financing it provides at a favourable interest rate. It’s no wonder that HELOCs are now the biggest source of personal loans in Canada, accounting for roughly 59% of non-mortgage personal debt. HELOCs became extremely popular in the United States between 2005 and 2008, right around the time the housing market was going belly up and paving the way for the biggest financial collapse since the Great Depression. According to experts, HELOCs that originated during this period are likely still underwater today, despite a strong recovery in US home prices over the past several years. “Underwater” means that the LTV ratio on the outstanding loan secured by the property is 125% or higher. In Canada, the maximum HELOC rate varies based on institution. Banks typically cap HELOCs at 65% LTV, although some institutions allow this to be combined with a 15% fixed or variable portion to receive up to 80%. HELOCs up to 80% LTV can be arranged through credit unions. Borrowing limits rise automatically with each mortgage payment, creating a constantly rising source of potential credit. 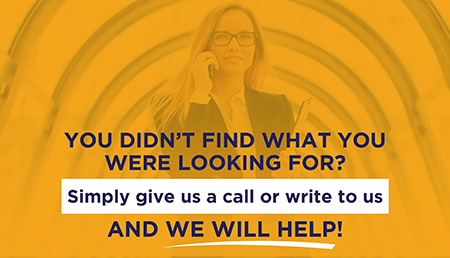 With house prices rising dramatically, this has many people in the mortgage industry concerned about runaway debt, especially since HELOCs typically provide people with far more money than they could otherwise get with an unsecured credit card. Over-leveraged homeowners are increasingly turning to private lenders to refinance their existing homes, renovate property or consolidate debt into one manageable payment. Private loans have also become an attractive option for investors looking to capitalize on the housing boom. For investors in particular, private financing provides the benefit of numerous loan options, faster approval and less focus on a one’s credit score. By borrowing through private investors as opposed to banks, individuals have greater flexibility in structuring their loan and payment terms. Perhaps more importantly, private loans and alternative mortgage services aren’t governed by strict lending guidelines imposed by the federal government and CMHC. Since the 2008 financial crisis policymakers have gone to great lengths to restructure the Canadian mortgage market to avoid a US-style collapse. In recent years the government has enacted several changes in an effort to rein in rising consumer debt and ensure that the housing market grows at a sustainable pace. However, it’s clear from the growing number of individuals being turned away from bank loans that demand for mortgages continues to rise. Mortgages that were easily granted just a few years ago are being withheld today, leaving a large and growing segment of the Canadian population with limited financing options. 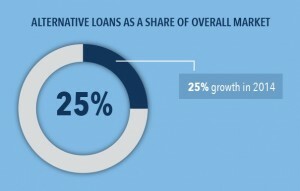 This suggests alternative financing options provided by private lenders and other investors will grow to fill the gap. It’s also important to bear in mind the challenging economic climate facing Canada at the start of 2016. Foreclosures in Calgary alone spiked 30% in the final quarter of 2015 as the oil price collapse continued to drag on the economy. Overall employment in Canada rose just 0.9% in 2015, with unemployment also rising half a percentage point for the year to close at 7.1%. This suggests more Canadians have entered the labour force, but are finding it difficult to find work. As one might expect, loss of wages due to layoffs and prolonged unemployment is a major strain on households paying down mortgages. While Canada’s mortgage market is growing at a steady pace, it’s important to continue monitoring trends in household debt, employment and the broader economic and financial climate. These factors can and will continue to impact residential mortgage practices across Canada. Monitoring trends in consumer behaviour is especially important given the growing appetite for loan products both inside and outside the residential housing market. Concerns about ballooning household debt are precisely what prompted the federal government and CMHC to take measures to limit household exposure to mortgage debt, making it difficult for some borrowers to secure loans. In this environment, we expect private loans and other forms of alternative financing to grow in popularity. The Canadian economy is projected to have grown 1.2% in 2015, according to the Bank of Canada’s revised estimate. Growth is forecast to pick up only modestly this year, averaging 1.4%. By comparison, the global economy expanded 3.1% last year and is expected to growth 3.3% in 2016. Clearly, Canada’s economy faces an uphill battle over the next two years as regional markets rebound from the devastating oil shock. A firmer US economy and weaker loonie are expected to help Canadian exporters remain competitive during the prolonged slowdown. Monitoring trends in the Canadian economy is extremely important in the context of mortgage lending. A shaky domestic economy led to two rate cuts in 2015. According to analysts, the BOC may lower interest rates again at some point this year in order to promote growth and push inflation back up toward its target. However, another rate cut could lead to a ballooning of household debt, which the Bank has already flagged as a key vulnerability. 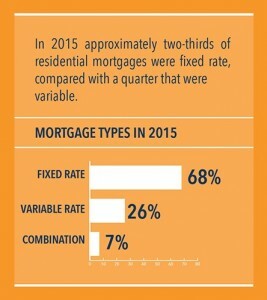 Mortgage Professionals Canada (December 2015). Annual State of the Residential Mortgage Market in Canada. Financial Post Staff (October 1, 2015). “Canadian home prices are growing at one of the fastest paces in the world.” Financial Post. CBC News. (December 15, 2015). “Bank of Canada says housing, debt threaten financial system.” CBC News. Garry Marr and Barbara Shecter (December 15, 2014). “Subprime lending market in Canada skyrockets to record as banks tighten reins.” Financial Post. 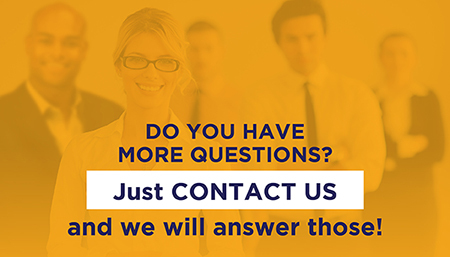 Mortgage Professionals Canada. A Profile of Home Buying in Canada (From January 2013 to May 2015). Reuters (February 5, 2016). “Canadian housing starts slow in January: CMHC.” The Globe and Mail. Janet McFarland (May 11, 2015). “Growing popularity of home equity lines of credit spurs debt warnings.” The Globe and Mail. Diana Olick (March 5, 2015). “Home equity loans face new risk.” CNBC. Colleen Underwood (January 13, 2016). “Calgary foreclosures spike 30% as investors look for deals.” CBC News. Statistics Canada. Labour Force Survey, December 2015. The Daily. Bank of Canada (January 2016). Monetary Policy Report.